The infographic Watch Styles & Shape by Kingery Feller explains some of the more popular watch shapes and designs as well as their most common uses. 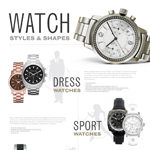 The infographic looks at the top watch designs which include dress, sports, diver, aviator, fashion and retro watches. This should assist you in helping pair up the perfect watch with your attire.